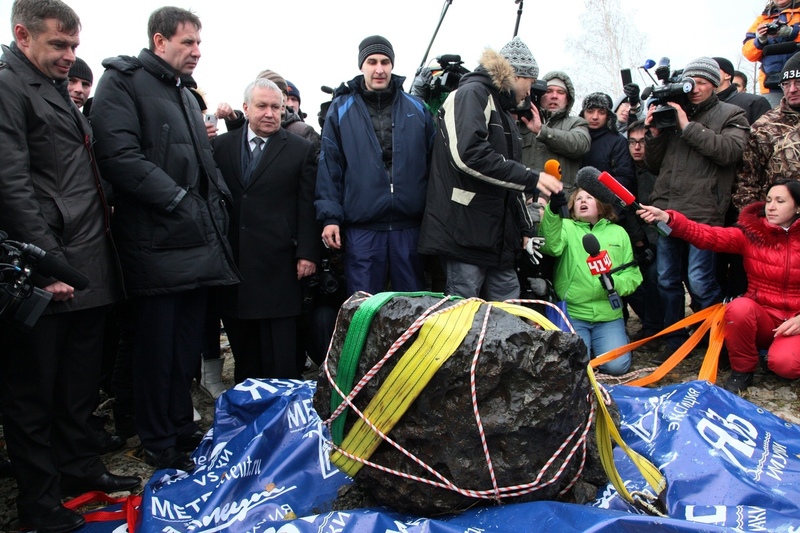 Divers In Russia Dredge Up A Half-Ton Chunk Of Meteorite : The Two-Way The recovery wasn't easy. The space rock ended up breaking into three large pieces as it came up. People look at what scientists believe to be a chunk of the Chelyabinsk meteor, recovered from Chebarkul Lake near Chelyabinsk, about 930 miles east of Moscow. Remember that bus-sized meteor that stunned thousands and injured hundreds across Russia when it entered the atmosphere and produced a massive shockwave last February? Well what survived the incredible temperatures came crashing into Lake Chebarkul in central Russia, and today, divers dredged up a 1,255-pound chunk. "Live footage showed a team pull out a 1.5-metre-long (five-foot-long) rock from the lake after first wrapping it in a special covering and placing it on a metal sheet while it was still underwater. "The fragment was then pulled ashore and placed on top of a scale for weighing, an operation that quickly went wrong. "The rock broke up into at least three large pieces as it was lifted from the ground with the help of levers and ropes. "Then the scale itself broke, the moment it hit the 570kg (1,255lb) mark." It may take awhile for the rock to be certified as coming from space, but the curator of meteorites at London's Natural History Museum tells the BBC the rock has all the markings of a meteorite. RIA Novosti, the official state news agency of Russia, quotes Viktor Grokhovsky, a member of the Russian Academy of Sciences' meteorite commission, which examined other fragments, as saying: "It's a typical meteorite, judging by its appearance — [I'm] 105 percent [sure]. There's no doubt about that, [it has] a thick melted crust, while dents reveal typical structures of the Chelyabinsk meteorite."